As Infowars has documented over the last two days, photos taken from the scene of the blast show numerous individuals wearing identical clothing while carrying heavy black backpacks, talking into cellphones and in one case placing one of the backpacks on the ground. 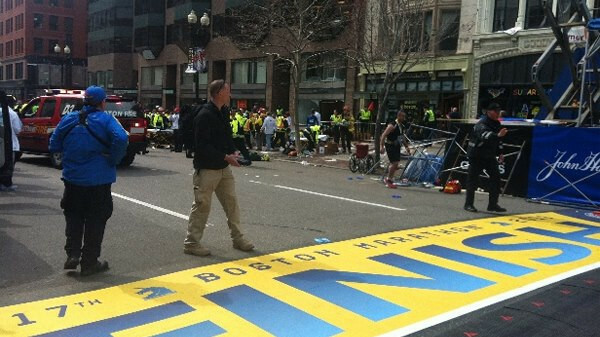 Infowars reporter Dan Bidondi was at the FBI press conference and attempted to get questions answered about bomb drills that eyewitnesses said were taking place on the morning of the marathon, but was ignored and subsequently confronted by two large men at the end of the conference. In not only ignoring but aggressively attempting to discredit the photos showing men who are likely employees of the private security firm Craft International on the scene of the bombings engaged in some kind of drill, the FBI has signaled its intention to continue the cover-up of what really happened. View the photos the FBI says are “not credible” and refuses to even address below.